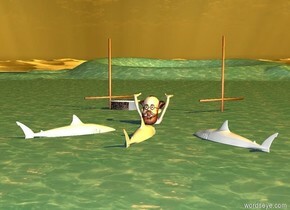 a shark.the ground is water.the shark is 1 feet in the ground.a second shark is 1 feet left of the shark.a third shark is 4 feet right of the shark.the second shark is facing southeast.the third shark is facing southwest.a man is 2 feet in front of the shark.the man is -1 feet left of the shark.the man is 3 feet in the ground.the man is facing north.a boat is 6 feet in front of the man.the boat is facing left.the sun is orange. there is a huge stage. the first santa claus is -35 feet above the stage. he is 8 feet tall and 3 feet wide. he is facing southwest. the first huge head is -2.3 feet above the first santa claus. the hair of the first huge head is bright red orange. the second santa claus is -1.5 feet to the right of the first santa claus. he is 7 feet tall and 3 feet wide. he is facing southeast. the second huge head is -1.6 feet above the second santa claus. the hair of the second huge head is bright yellow. the black wall of the stage. the red curtain of the stage. the third santa claus is -8 inches to the left of the first santa claus. he is 8.5 feet tall and 3 feet wide. he is facing southeast. the third huge head is -1.8 feet above the third santa claus. the hair of the third huge head is bright yellow. the fourth santa claus is -1.5 feet to the left of the third santa claus. he is 7 feet tall and 3 feet wide. he is facing southwest. the fourth huge head is -1.6 feet above the fourth santa claus. the first big christmas tree is 5 feet to the left and 1 foot behind the fourth santa claus. the second big christmas tree is 5 feet to the right and 1 foot behind the first santa claus. the ground is wood. the staircase of the stage is wood. the yellow light is 3 feet in front and 3 feet above the second santa claus. the hot pink light is 3 feet in front and 3 feet above the fourth santa claus. 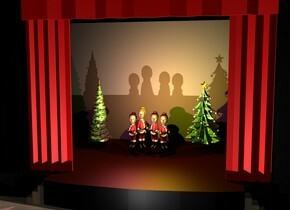 the matte wall of the stage is unreflective. the bright white light is 6 feet in front and -40 feet above the stage. the camera light is black. 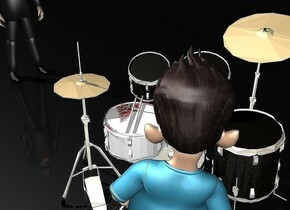 the drum kit. the ground is black. the sky is black. the boy is in front of the drum kit. he is facing back. the man is 3 feet behind and 3 feet to the left of the drum kit. he is facing southeast. the snare drum of the drum kit has a [blood] texture. the [blood] texture is 2 feet tall. the nurse is 30 feet above the ground. she is facing back. the dress of the nurse is white. the ground is translucent. the small hat is -1.7 feet above and -5.8 feet to the right of the nurse. it is leaning 30 degrees to the right. the nurse is leaning 30 degrees to the left. the bag is -1.8 feet to the left of the nurse. it is -4.2 feet below the nurse. it is facing northeast. the white and pink umbrella is -4 feet to the right of the nurse. it is -1.4 feet above the nurse. the house is 70 feet behind and 30 feet to the left of the nurse. it is on the ground. the boy is -10 feet above the house. he is -20 feet to the right of the house. he is 8 feet tall. he faces southeast. the girl is .5 inches to the left of the boy. she faces southeast. she is 11 feet tall. the big man is behind the boy. he faces southeast. the big woman is to the left of the man. she faces southeast. the big barrel is leaning 90 degrees to the right. the big hound is -5 feet above the barrel. it faces left. it is -3.2 feet to the left of the barrel. the big fox is 3.8 feet to the left of the barrel. it is on the ground. it faces southeast. the rope is -2.5 feet to the left of the hound. it faces front. it leans 30 degrees to the right. 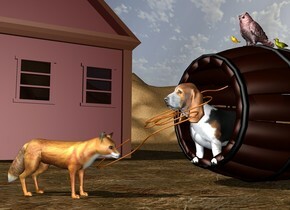 the big brown cabin is 20 feet behind the fox. the ground is matte dirt. the maroon owl is on top of the barrel. it faces left. the orange sparrow is to the left of the owl. it faces left. the tiny olive albatross is to the right of the owl. it faces left. the big haunted house. the very big cyan dragon is 55 feet above the ground. it is 6 inches to the right of the haunted house. it is 20 feet behind the haunted house. it faces southwest. the dragon leans 20 degrees to the front. the amber train is 15 feet to the left of the haunted house. it faces southeast. the very huge witch is -29 feet above the haunted house. she is -18 feet behind the house. the [water] texture is on the ground. the [water] texture is 800 feet tall. the big ladder is -8 feet to the right of the house. it is facing left. it is leaning 20 degrees to the front. the very big girl is -21 feet above the dragon. she is -70 feet in front of the dragon. she is facing southwest. she is leaning 10 degrees to the front. the big sidewalk is in front of the haunted house. it is 100 feet long. the first mahogany fence is to the left of the sidewalk. it faces right. it is 100 feet long. the second mahogany fence is to the right of the sidewalk. it faces left. it is 100 feet long. the ground is shiny. the [texture] big ghost is 22 feet to the right of the sidewalk. the very gigantic baby is -4 feet above and -3 feet to the left of the haunted house. the gigantic shiny green frog is -15 feet behind the sidewalk. the first very big olive green head is -4 feet above and -1 feet to the right of the haunted house. the second very big olive green head is -4 feet above and -4 feet to the right of the haunted house. the third very big olive green head is -4 feet above and -8 feet to the right of the haunted house. 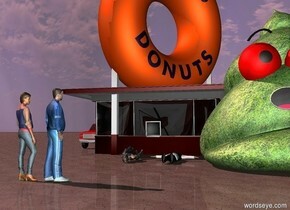 the first big shiny 3d cartoon object is 60 feet in front of the frog. it faces north. it is red. 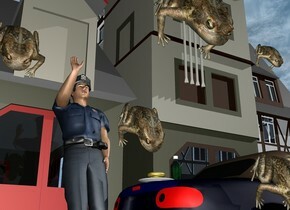 the second big shiny 3d cartoon object is 40 feet in front of the frog. it faces north. it is orange. the orange light is to the left of the house. the green light is to the right of the house. the yellow light is in front of the train. the purple light is behind the ghost. 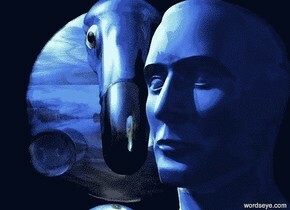 a 20 feet tall night blue shiny first dodo leans 45 degrees to the front. A 1 feet wide yellow-green shiny third sphere. It is -11.1 feet above and -4.75 feet left of and -4.66 feet in front of the first dodo. A 0.6 feet wide black dull fourth sphere. It is -0.83 feet above and -0.64 feet left of and -0.65 feet in front of the third sphere. a 4 feet tall hydrangea blue dull head is 11.5 feet above the ground. it is -1 feet in front of and -5.5 feet right of dodo. it is facing southwest. 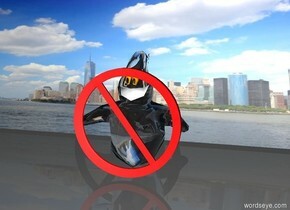 a 7 feet tall shiny 1st [image] emoticon is -6 feet in front of and -16 feet above the dodo. a 40 feet wide and 30 feet high black translucent shiny wall is 0.5 feet behind the 1st emoticon. it is 2 feet in the ground. a 1.5 feet tall white translucent moon is in front of and -2 feet left of and -6 feet above the 1st emoticon. a 3 feet tall shiny white 2nd emoticon is -4.5 feet left of and below the 1st emoticon. the ground is clear. a 1st night blue light is -2 feet in front of and 8 feet left of and -2 feet above the dodo. the camera light is black. a orange 2nd light is in front of and -1 feet above the 2nd emoticon. it is afternoon. a 3rd white light is left of and 0.2 feet in front of and above the 1st emoticon. the sunlight is petrol blue. the ambient light is electric blue. a 15 feet tall clear glass sphere.a boy is 12 feet in the sphere.a radio is left of the boy.a white light is in front of the boy.a 15 feet tall man is 2 feet left of the sphere.the man is facing the sphere.a 14.5 feet tall woman is 3 feet right of the sphere.the woman is facing the boy.the woman's hair is yellow.the boy's shirt is red.the man is texture.a 5 feet tall dog is in front of the sphere.the dog is facing northwest.the ground is grass.the sun's altitude is 85 degrees.the sun is violet. a man.a woman.the woman is in front of the man.the woman is facing the man.the sun is pink.a tree is 3 feet in front of the man.a red light is above the tree. 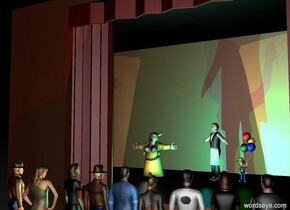 a 22 feet tall stage.a man is 19 feet in the stage.the man is facing southwest.a woman is 2 feet left of the man.a boy is right of the man.the sun's altitude is 90 degrees.there are nine humans 6 feet in front of the stage.the nine humans are facing the stage.a white light is in front of the woman.a cyan light is in front of the man.a red light is in front of the stage.a green light is in front of the boy.it is night.a purple light is left of the stage. 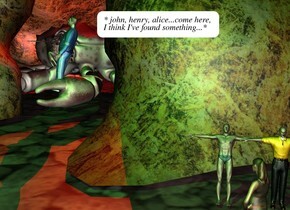 the humongous crab is -20 feet in front of the cave. the first small man is -3 feet in front of the crab. he is facing left. he is leaning 20 degrees to the back. he is -10 feet to the right of the crab. he is a foot above the ground. the red light is 2 feet above the crab. it is night. the green light is 3 feet above and 10 feet in front of the cave. the second very small man is 3.5 feet in front of the crab. he is -3.5 feet to the right of the crab. he is leaning backwards. the third very small man is -6 inches to the right of the second man. the very small woman is 1 foot in front of and -8 inches to the right of the second man. she is facing the crab. 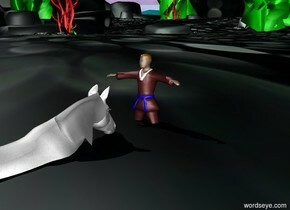 the grey woman is leaning 8 degrees to the left. 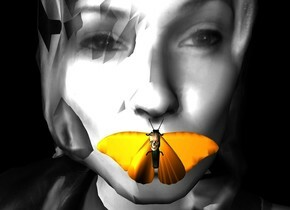 the 2.6 inch wide butterfly is in front of the woman. it is 5.1 feet above the ground. it is -10.8 inches to the right of the woman. it is facing up. the .35 inch tall bone is in front of the butterfly's head. the sky is black. the ground is black. the sun is black. the small light is 5 feet left of the butterfly. a tiny ball. a 1st 10 feet tall dodo is 2 feet behind the ball. it is facing the ball. it leans 40 degrees to the front. it is 3 feet in the ground. a 2nd 10 feet tall dodo is 2 feet behind the ball. 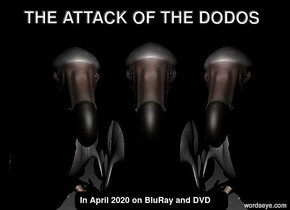 it is -3.5 feet left of the 1st dodo. it leans 40 degrees to the front. it is 3 feet in the ground. it is facing the ball. 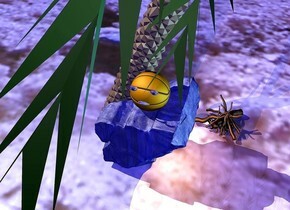 a 3rd 10 feet tall dodo is 2 feet behind the ball. it is -3.5 feet right of the 1st dodo. it leans 40 degrees to the front. it is 3 feet in the ground. it is facing the ball. it is night. there is a white light in front of and -5 feet above the 1st dodo. the camera light is black. a [computer] wall. the ground is metal. the sky is white. a grey table is 1 foot in front of the wall. a man is on the table facing east. the man is leaning 90 degrees to the north. a small snake is -1 foot above the man. the snake is -5 feet to the east of the man. the snake is -4 feet south of the man. the snake is facing south. a white woman is just west of the table. 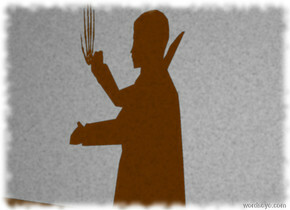 the woman is facing east. a white man is just east of the table. the man is facing west. The yellow Volkswagen bus is facing right. The boy is to the left of the yellow Volkswagen bus. He is facing right. The woman is 2 feet in front of the boy. She is facing back. The first man is behind the boy. He is facing front. The second man is in front of the boy. He is facing right. The stage is 100 feet to the right of the yellow Volkswagen bus. It is facing the yellow Volkswagen bus. There is a fuschia billboard 50 feet to the right of the yellow Volkswagen bus. It is 5 feet behind the yellow Volkswagen bus. The big pink cartoon is on top of yellow Volkswagen bus. It is facing southwest. There is a pink light to the left of the stage. There is a yellow light above the pink cartoon. The third man is 1 foot to the left of the pink cartoon. He is facing front. There is a yellow light below the yellow Volkswagen bus. a 10 inch tall and 2 inch wide 1st cylinder.-0.1 inch above the 1st cylinder is a 2 inch tall 1st igloo.-0.9 inch above the 1st igloo is a 2 inch tall 2nd igloo.-0.1 inch above the 2nd igloo is a 0.5 inch wide 2nd cylinder. above the 2nd igloo is a 0.4 inch wide 3rd cylinder. the 3rd cylinder is leaning 45 degrees to left.the 3rd cylinder is -0.5 inch right of the 2nd cylinder.the ground is black.the camera light is dark blue.behind the 1st cylinder is a 1st wheel.the 1st wheel is 20 inch tall. the 1st wheel is facing west.the 12 wheel is 12 inch in the ground.a 2nd 20 inch tall wheel is -12 inch left of the 1st wheel.the 2nd wheel is facing west.the 2nd wheel is 15 inch in the ground. -12 inch right of the 1st cylinder is a 4th 2 inch wide cylinder. 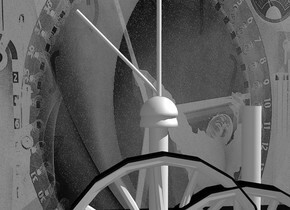 5 inch in front of the 1st wheel is a [KAWE10] wall.the wall is 3.3 feet tall and 3.3 feet wide. 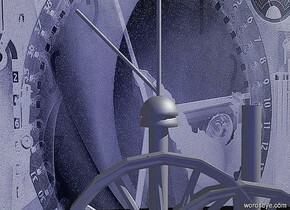 the ambient light is gray.the 1st wheel is gray.the 2nd wheel is gray. the 1st cylinder is gray. the 2nd cylinder is gray. the 3rd cylinder is gray.the 4th cylinder is gray. the 1st igloo is gray. the 2nd igloo is gray. There is a large wall at the front of the large wall. the wall is facing left. There is a table 6 feet to the right of the wall. a big burger is on the table. A man is on the left of the table. a man is on the right of the table. 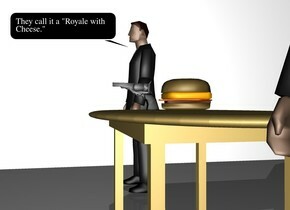 there is a gun in front of the burger. 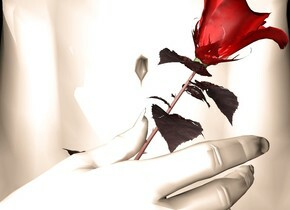 There is a man and a woman. The man is facing the woman. the woman is facing the man. The ground is white. 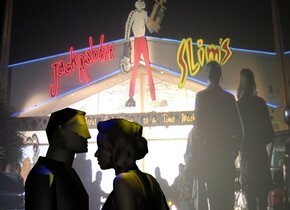 There is a yellow light above the woman.there is a blue light above the man. it is night. There is a large [slims] wall 10 feet behind the woman. the ground is tile.camera light is dim. 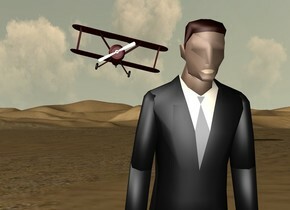 a first man.a first woman is left of the man.a building is 20 feet behind the first man.a vehicle is left of the building.a second woman is 2 feet in front of the building.the second woman is face down.a second man is 1 feet right of the second woman.the first man is facing northeast.the first woman is facing northeast.the second man is face up.a 15 feet tall poop is right of the second man.the ground is dirt.the poop is texture.the poop's eye is red.the sun is pink. the vampire is 20 feet in front of the very tall wide wall. he is facing left. the light is 8 feet in front of the vampire and 5 feet above the ground. it is night. the camera light is black. the long hand is -4 inches above the hand of the vampire. it is facing forward. it is upside down. The big not sign is in front of the white ghost. the [new york] wall is behind the ghost. the sun is black. a 10 inch tall and 2 inch wide 1st cylinder.-0.1 inch above the 1st cylinder is a 2 inch tall 1st igloo.-0.9 inch above the 1st igloo is a 2 inch tall 2nd igloo.-0.1 inch above the 2nd igloo is a 0.5 inch wide 2nd cylinder. above the 2nd igloo is a 0.4 inch wide 3rd cylinder. the 3rd cylinder is leaning 45 degrees to left.the 3rd cylinder is -0.5 inch right of the 2nd cylinder.the ground is black.the camera light is dark gray.behind the 1st cylinder is a 1st wheel.the 1st wheel is 20 inch tall. the 1st wheel is facing west.the 12 wheel is 12 inch in the ground.a 2nd 20 inch tall wheel is -12 inch left of the 1st wheel.the 2nd wheel is facing west.the 2nd wheel is 15 inch in the ground. -12 inch right of the 1st cylinder is a 4th 2 inch wide cylinder. 5 inch in front of the 1st wheel is a [KAWE10] wall.the wall is 3.3 feet tall and 3.3 feet wide. the ambient light is dark gray. A a light blue woman. a castle has [glass] texture. the woman is -3.5 feet to the south of the castle. the woman is 25 feet off the ground. 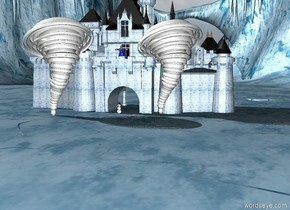 a small white tornado is south of the castle. the tornado is 5 feet west of the woman. another small white tornado. the tornado is 5 feet east of the woman. the tornado is on the ground. a snowman is south of the castle. the piano is in front of the huge wall. the orange unreflective ground. the grandfather clock is 3 feet to the left of the piano. the [texture] wall. the bench is in front of the piano. the small man is sitting on the bench. he is facing back. the woman is to the left of the man. she is on the ground. she is facing back. the orange chair is 2 feet to the right and 7 feet in front of the piano. it is facing southwest. the table is 2 feet to the left and 7 feet in front of the piano. it is facing southeast. the radio is above the table. it is facing southeast. 1st dalmatian is on top of the piano. it is facing south. 2nd dalmatian is to the right of 1st dalmatian. 3rd small dalmatian is above the grandfather clock. 4th dalmatian is to the right of the grandfather clock. the 5th dalmatian is in front of the chair. it is facing southwest. 6th dalmatian is in front of the piano. it faces back. 7th dalmatian is 1 foot to the right of 6th dalmatian. it faces back. 8th dalmatian is 4 feet in front of the 5th dalmatian. it faces northwest. 9th small dalmatian is 4 feet to the left of 8th dalmatian. it faces back. 10th dalmatian is to the right of 9th dalmatian. it faces back. 11th dalmatian is to the right of 10th dalmatian. it faces back. 12th dalmatian is 1 foot to the right of 11th dalmatian. it faces northwest. 13th dalmatian is to the right of 12th dalmatian. it faces northwest. the 14th dalmatian is to the right of the table. the small 15th dalmatian is in front of the 14th dalmatian. it faces northeast. 16th dalmatian is in front of 15th dalmatian. it faces northeast. 17th dalmatian is in front of 16th dalmatian. it faces northeast. 18th dalmatian is 3 feet to the left of 10th dalmatian. it faces northeast. 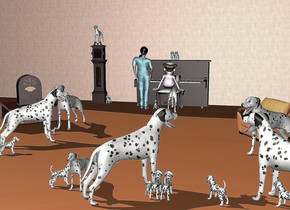 the 19th small dalmatian is to the right of 18th dalmatian. 20th dalmatian is to the right of the 19th dalmatian. it faces northeast. the man is leaning 20 degrees to the front. his tie is grey. his lip is tan. 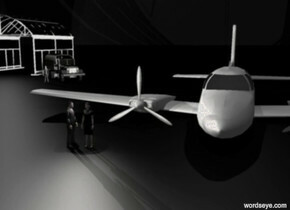 the dark red airplane is 60 feet behind and 5 feet above the man. the airplane is leaning 13 degrees to the left. The ground is black. The sky is black. A fetus. 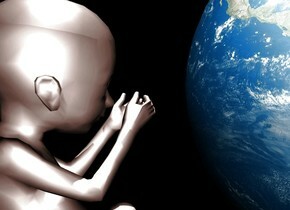 The tiny earth is in front of the fetus. 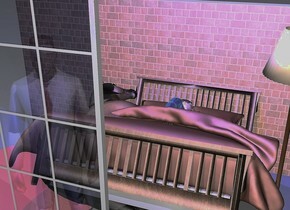 A white light is above the fetus. It is night. a small arch. the arch is [shiny]. 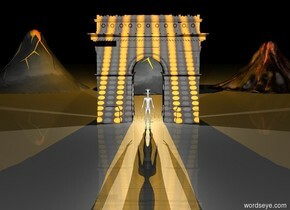 a huge alien is 10 feet in front of the arch. the alien is white. a huge white light is 15 feet behind the alien and 10 feet above the floor. it is night. a 1st volcano is 100 feet behind the arch. a 2nd volcano is 5 feet left of the 1st volcano. a 3rd volcano is 5 feet right of the 1st volcano. a huge orange light is above the 1st volcano. a grey huge missile. the missile is 1000 feet off the ground. the missile is leaning 50 degrees to the south. the missile is facing north. the ground is [satpic] texture. the texture is 1500 feet tall. 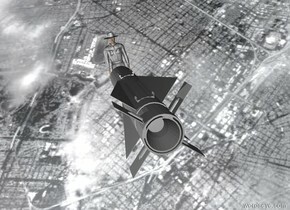 a grey small cowboy is -2 feet north of the missile. the cowboy is leaning 50 degrees to the north. the ground is [goldcoins] texture. the texture is 1 inch tall. the sky is [stone] texture. the texture is 100 feet tall. 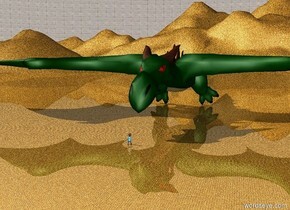 a huge dragon. a tiny man is a few feet in front of the dragon. the tiny man is facing the dragon. 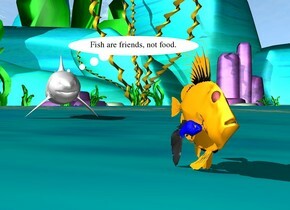 the blue fish is next to the orange fish. a shark is 8 feet behind the blue fish. 1st 10 feet tall and 50 feet long [tile] wall is left of the bathtub. it faces right. a 7 feet wide clear white curtain is right of the bathtub. it faces right. the ground is [tile]. 2nd 10 feet tall and 15 feet long [tile] wall is 1 feet in front of the bathtub and -0.1 feet right of the 1st wall. a basin is 2 feet right of the bathtub and 0.1 feet behind the 2nd wall. it faces back. 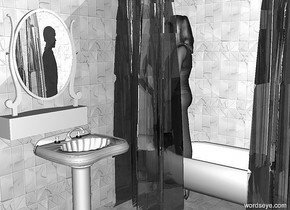 a white mirror is above and -1.5 feet right of the basin and -0.1 feet behind the 2nd wall. a woman is -1.9 feet right of and -1 feet to the front of the bathtub. she is 0.4 feet above the ground. a man is 7 feet behind the mirror and on the ground. he is 1.5 feet right of the 1st wall. the small man is sitting on the bench. he is -1 feet in front of the bench. he is -2.6 feet to the right of the bench. the small suitcase is 6 inches to the right of the man. it is facing right. the ground is silver. the sky is white. a box is -2 feet above the man. The bed is on the ground. The horse is 1.4 feet in the bed. It is facing to the back. The horse is leaning 80 degrees to the left. The bed is leaning 30 degrees to the back. The man is -2.2 feet to the right of the horse. He is facing right. He is leaning 85 degrees to the left. He is 8 inches in the bed. The window is 3 feet in front of the bed. It is 5 feet above the ground. The mauve light is 3 feet above and in front of the window. the [brick] wall is behind the bed. the tiny shiny red pond is -1 feet to the left of the bed. the blue light is 2 feet above the bed. a second white man is 3 feet in front of and to the left of the window. he is facing the window. he is on the ground. the second man is 8 feet tall. the lamp is -1 feet to the right of the bed. it is 8 feet tall. A 20 feet tall first dodo. A 1 feet wide white dull sphere. It is -2.0 feet above and -4.78 feet right of and -5 feet in front of the first dodo. A 0.6 feet wide black dull sphere. It is -1.80 feet above and -4.39 feet right of and -4.6 feet in front of the first dodo. A 1 feet wide white dull sphere. It is -2.0 feet above and -4.78 feet left of and -5 feet in front of the first dodo. A 0.6 feet wide black dull sphere. It is -1.80 feet above and -4.39 feet left of and -4.6 feet in front of the first dodo. a 40 feet tall and 60 feet wide window is 10 feet behind the dodo. a 40 feet tall and 70 feet wide 1st wall is right of and 0.1 feet in front of the window. it is facing west. a 40 feet tall and 60 feet wide 2nd wall is 70 feet in front of the window. a 20 feet tall couch is -28 feet above the dodo. a 10 feet deep and 7 feet wide [dodoprime] photograph is 0.2 feet in front of the 1st wall. it is 5 feet in front of the window. it leans 90 degrees to the front. it is facing west. it is 20 feet above the ground. 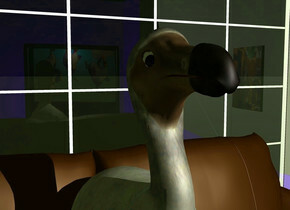 a 17 feet tall television is 12 feet in front of and -7 feet right of the dodo. it is facing north. it is 15 feet above the ground. the screen of the television has a [dodoice] texture. the [dodoice] texture is 18 feet tall. it is evening. there is a blue light in front of the television. the camera light is black. there is a white light behind and -2 feet above the television.